Good media coverage matters. To attract sponsors, and the race fans the sponsors need to justify their investment, series organizers need strong relationship with the media - journalists from print, broadcast and streaming media, as well as local news organizations. In my first visit, at the beginning of the their second season, the MotoAmerica series looks to be off to a solid start. The hard work of the organizers, their excellent reputation in the racing world and among the media, was in evidence at the 2016 preseason testing event. Josh Hayes has won the American AMA Superbike championship four times, with more than 60 race wins in that class alone. 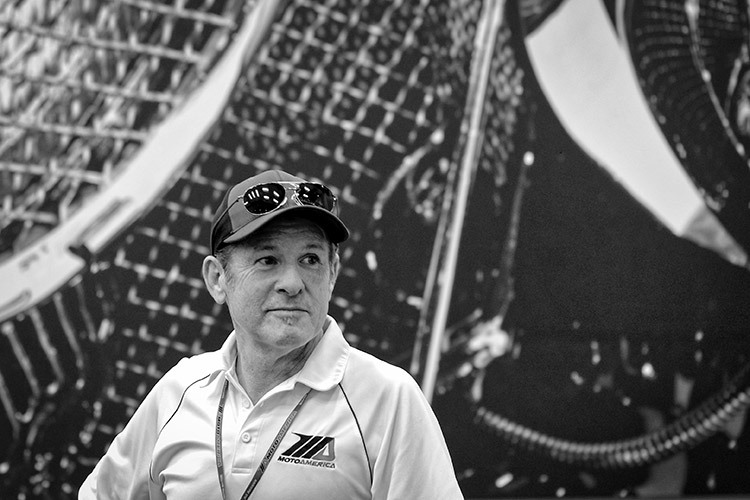 He has emerged as an exceptional ambassador for moto-racing in the Americas. He makes it a point to be available to the media as rider and member of the Graves Motorsport Yamaha Racing team, and as an articulate spokesman for the sport. The media want both a good storyline and the fewest obstacles to collecting the assets to tell it. 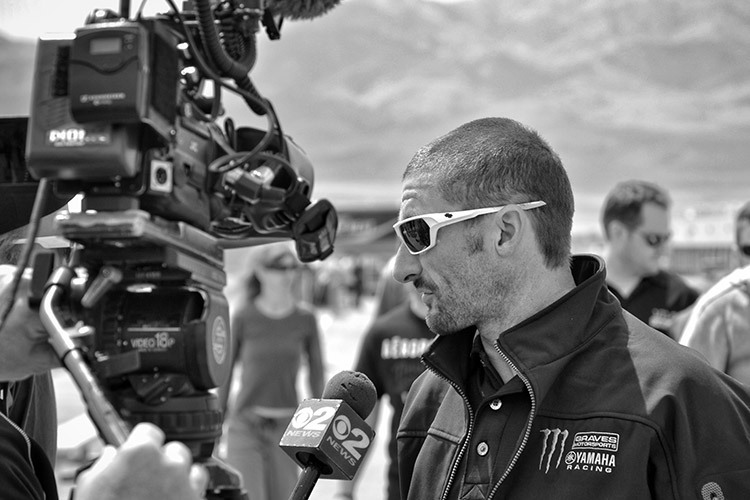 Paul Carruthers, Communications Manager for MotoAmerica, may be the most qualified person in America to help tell the story of this new series. Mr. Carruthers spent more than 30 years as a journalist and editor covering motorcycle racing of all kinds. Before joining MotoAmerica he served as editor for the weekly (yes, weekly) print version of Cycle News (relaunched in 2010 as a digital weekly). 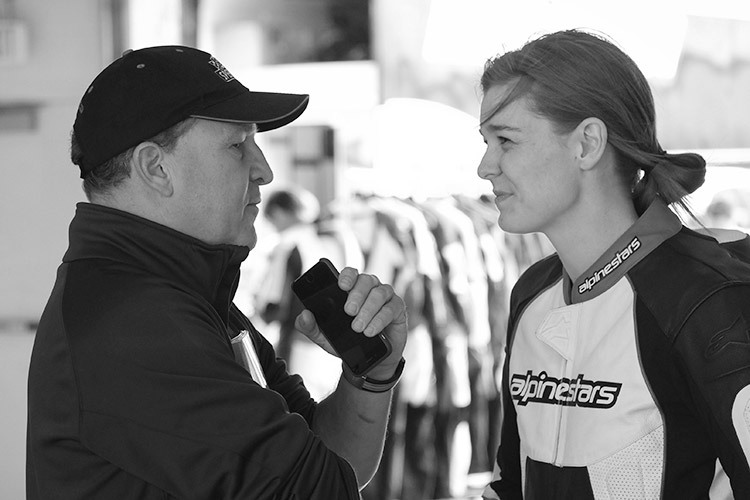 Having produced highly-regarded news and long-form content in a weekly cycle enables him to understand what the media need to cover MotoAmerica. 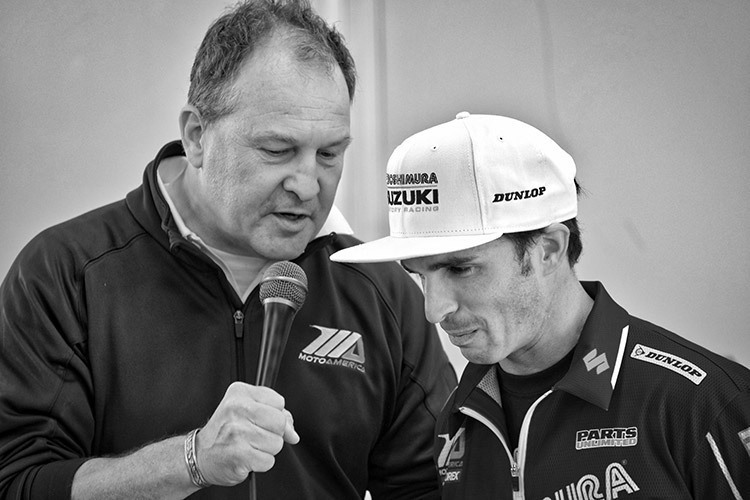 Jonathan Green interviews Tony Elias at the Yoshimura Suzuki Factory Racing team introduction in 2016. Elias is the 2010 Moto2 World Champion and has a total of 17 wins across all GP classes: 125cc; 250cc, Moto2 (600cc) and MotoGP. It was a delight to see Mr. Green in action. His voice is most familiar as the long-time broadcast commentator for the World Superbike Series, and he has had official broadcast roles as producer, commentator and reporter for many motorsports series including Formula One, with BSkyB, ESPN, Star TV, and Sky Sports. Coordinating events like this team introduction at a racing meeting is non-trivial. Team management, riders, the presenting media and the reporting media, and track operations need the plan laid out well ahead of time and a lot of shepherding to get all the assets in place at the right time. The MotoAmerica organization understands that the most precious commodities to media are timing and access to the story. 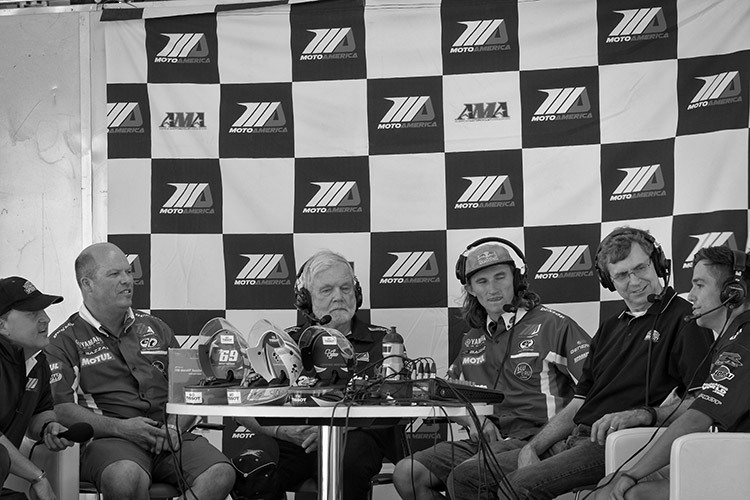 How to engage the mainstream press in coverage of moto-racing? Put a journalist on the back of a race bike piloted by a professional racer (Chris Ulrich) at race speeds and see what they write about that! A two-up ride program begun in 2001 by Roadracing World and Team Hammer/M4 Suzuki has provided hundreds of journalists a first-person experience of one of the most exciting forms of motorsport. 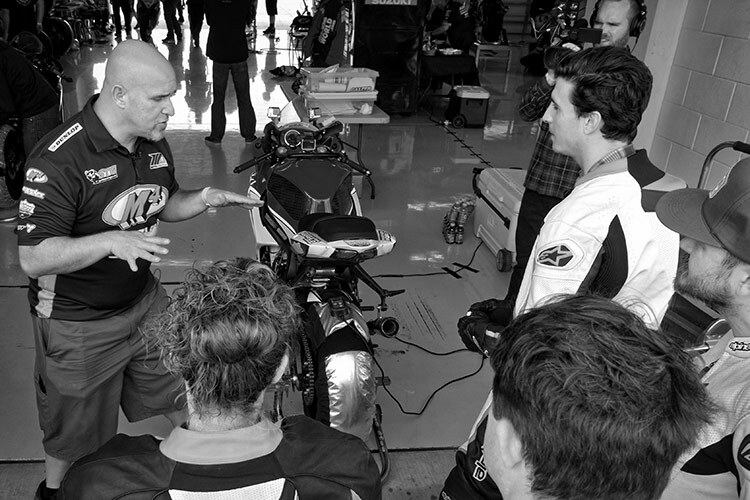 David Swarts (far left), Team Hammer/M4 Suzuki team member and Associate Editor for Roadracing World & Motorcycle Technology magazine, briefs journalists on what to expect. ... and following Emily's lap around the track (given by Chris Ulrich, M4 Suzuki manager/rider and RoadRacing World editor - not pictured). A track ride is worth a thousand words at a media briefing . 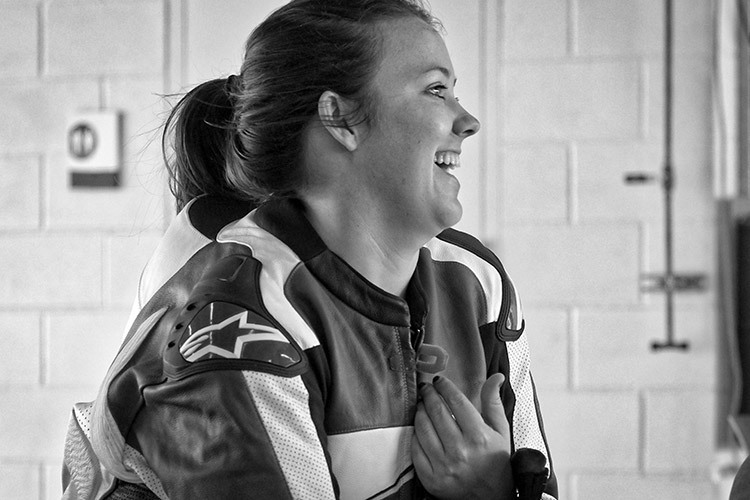 Kayla Williams gets suited up for her turn on the two-up track ride. Kayla is Senior Account Executive at Austin public relations firm Giant Noise contracted by MotoAmerica to interest local media in coverage of moto-racing at Circuit of the Americas - a sport unfamiliar to most local media. Engaging local PR companies in this way is part of Paul Carruther's smart management of MotoAmerica publicity. Jordan Steele, host of "We Are Austin" at Austin CBS affiliate KEYE TV, and cameraman capture video of the M4 Suzuki that is specially equipped for two-up riding. 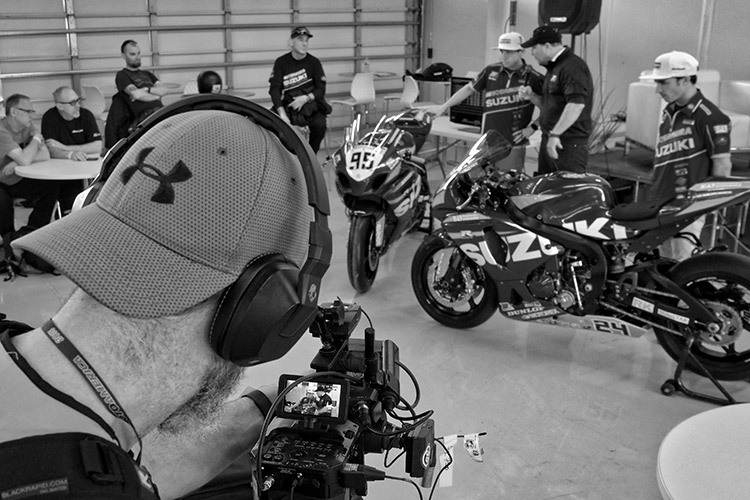 MotoAmerica work hard to coordinate rider interviews for media even with a packed race or test schedule. 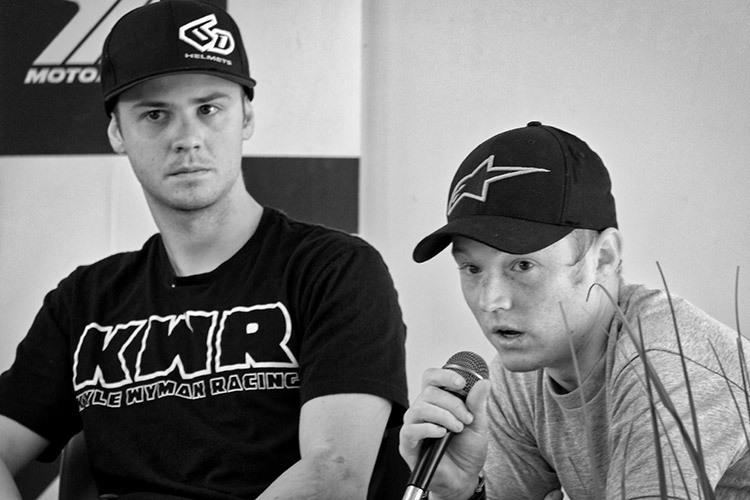 Kyle Wyman (left) waits for his turn at the mike as Dakota Mamola responds to questions about his move from European grand prix racing to his first year (2016) racing in the MotoAmerica Superstock 600 class. MotoAmerica began the 2016 race season by leveraging virtually every media format possible: web and print publications, international television coverage (via BeIn Sports), local broadcasters and podcasts. Here, the Speed City broadcast team and MotoAmerica staff record a Sunday "Speedcast" segment on the Austin test with 2015 MotoAmerica Superstock 1000 Champion Jake Gagne (third from right) and Josh Herrin (far right). Danny Walker, partner and manager of the Roadrace Factory team sponsoring Gagne's 2016 Superbike campaign, is second from left.